No Computer or Pencil Needed! Stylish, hand-drawn elevations, perspectives and floorpans are easily achieved with E-Z DECORATORTM design tools. Showcase your talent with stunning sketches that are fast and fun to create. Our booth at the High Point Furniture Market is always busy….here we are in April, 2018. Come take a look! THE E-Z DECORATOR Design System is a patented, exciting design tool for creating hand-drawn sketches…there is no software or drawing needed! The system consists of thousands of artist-drawn images of furnishings, accessories, architectural elements and window coverings, in ½” scale, printed onto static-cling “stickies.” You simply shop through the book, turning pages to see the vast assortment of the styles found in designer showrooms and stores, peel-off the drawings that you want to use in your interior design sketch, and assemble them onto the overlays attached to the special grid/ template.” Try this, try that”…..no need to ever erase. Simply remove another drawing and switch things around. It’s like playing with paper dolls! Once you’ve completed your drawing, take a photocopy. Then, remove the drawings from the grid and return them to their pages; they re-stick and never wear out. These custom drawings are certain to capture and communicate your unique design talent! Learn More. A patented system for creating accurate, artistic, ¼” scale birds-eye view floor plans and furniture layouts. There is no software or drawing required. 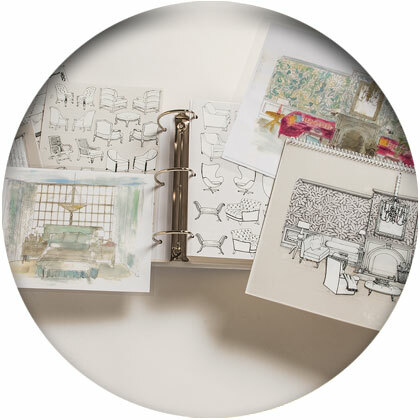 The custom binder houses 1,700 peel-and-stick, hand-drawn images that represent the latest design sizes of upholstery, case goods, and rugs. Also included are architectural symbols and flooring patterns, a washable pen and scale ruler. The ¼” scale, laminated grid/template board, with clear overlay, provides the surface for hour floor plan layout. 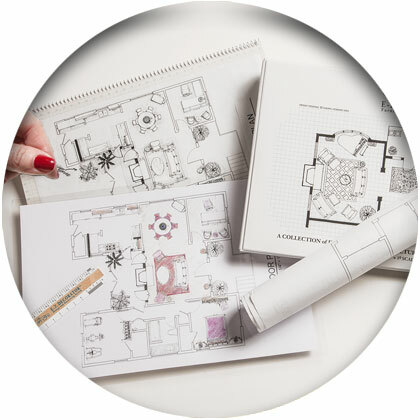 Either draw your room dimensions directly onto the laminated grid, or if you have an architectural plan in ¼” scale just slide it under the grid’s clear overlay; the “stickies’ will adhere right to your plan. Quickly and easily flip furniture around, try different seating arrangements, or even use the architectural symbols to assist with remodeling spaces and new-builds. When finished you can photocopy your layout, peel off the drawings from the grid and replace them onto their pages in the binder….they never wear out. In creating a beautifully scaled layout plan you can be confident that your selections will accurately fit your space. Learn More. Words cannot express my appreciation for all you did to develop this design system. It truly makes decorating fun and easy. My clients finally have a visual that gives them a true understanding of the finished project. Thank you for taking the time to bring the E-Z DECORATORTM System to us-you have done the world of decorating a true service. I purchased your entire E-Z DECORATORTM System last year…I LOVE it! What a wonderful invention, especially for designers such as I who are time and artistically challenged.